Storms have continually moved through my area today, bringing lightning, thunder and periods of heavy rain. It has been a good day to stay indoors, sipping juice, reading, journaling and watching a movie. There was also time for yoga and a bit of coloring and contemplation. As I wrote in my journal I thought about how empowering this week has been. Switching to a plant based lifestyle last July was crucial to me taking back responsibility for my health and well being. The desire to be healthier and free from pain and disorders enabled me to make choices for myself, no matter what anyone else thought or did. 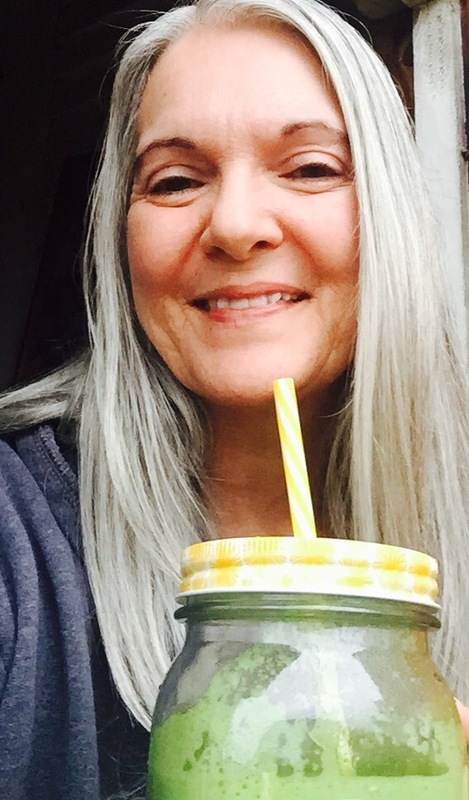 Juicing has been another choice I made, born partly out of curiosity and partly out of the desire to take nutition and healing to a whole new level. 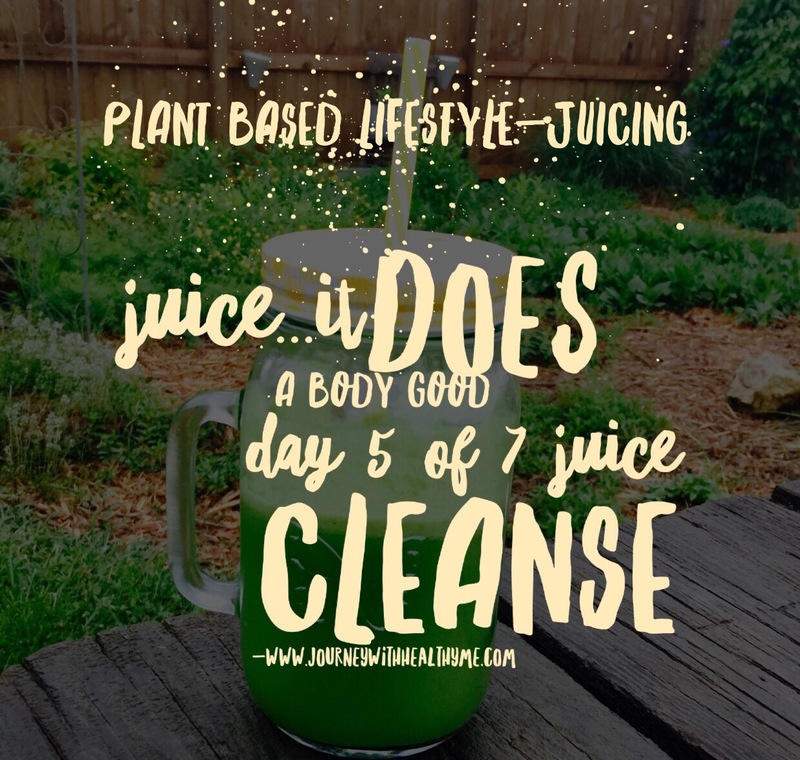 I like how juicing has made me feel this week…fit, healthy, lean, creative and oh so strong. I feel empowered by my raised awareness. I feel in tune with my body and its needs. 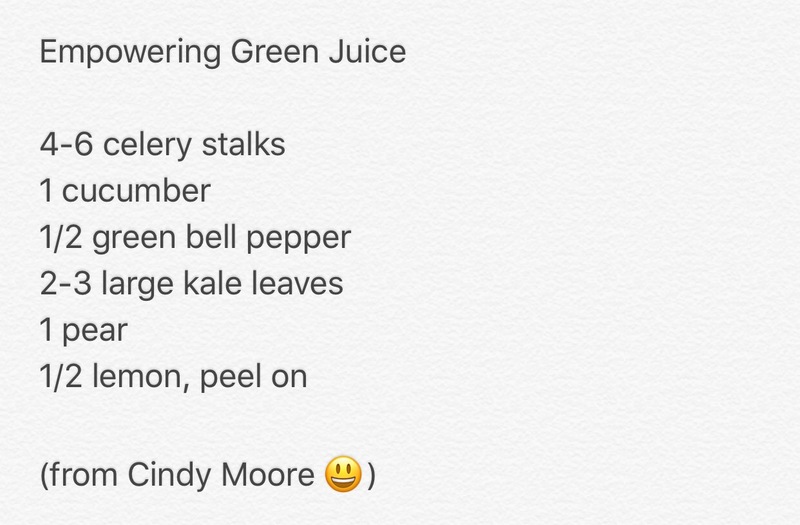 Today I tried a juice recipe from Jonny Juicer, my inspiration on Instagram, which was perfect for this chilly, gray day. 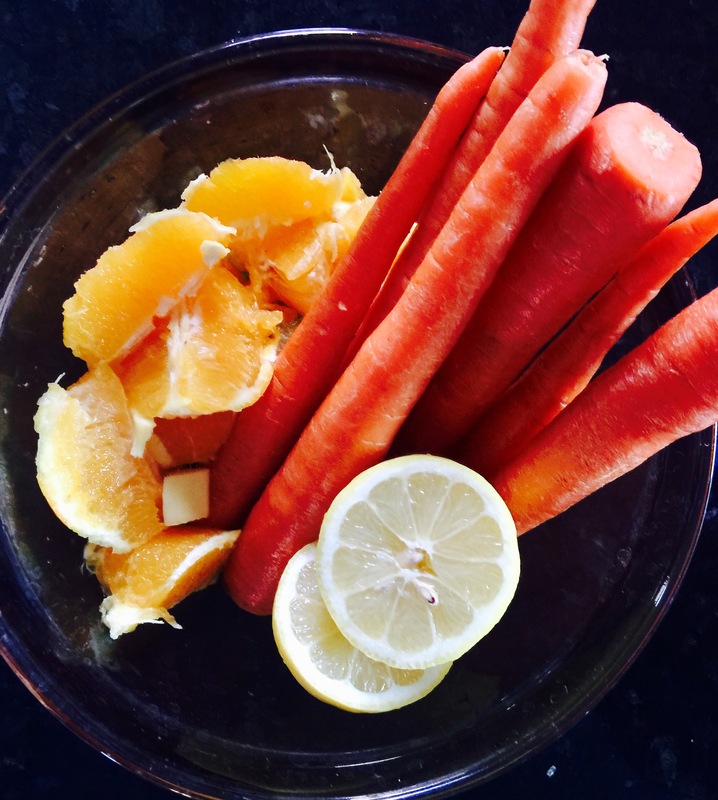 This recipe made 32 ounces of yummy juice. I shared it with Greg, who is doing a modified week of juicing (plenty of juice plus some cooked veggies and cashews), and he declared it his favorite thus far. I loved it too. Using oranges instead of apples made for a slightly less sweet juice, which I appreciated. And I’ve come to enjoy the fresh ginger in my juices. This one had a bit of extra zip with the turmeric. I didn’t have fresh so I used a dash of ground. I wanted a green juice for dinner and decided to create my own. 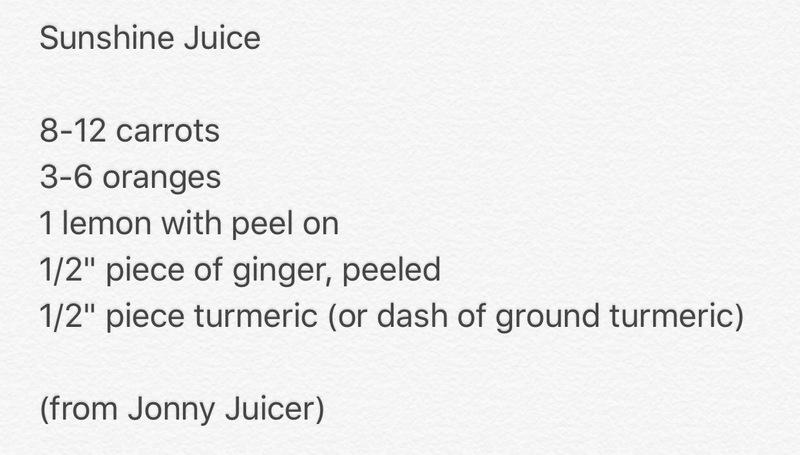 I’ve been following recipes all week and felt like I had a handle on what makes a great juice! 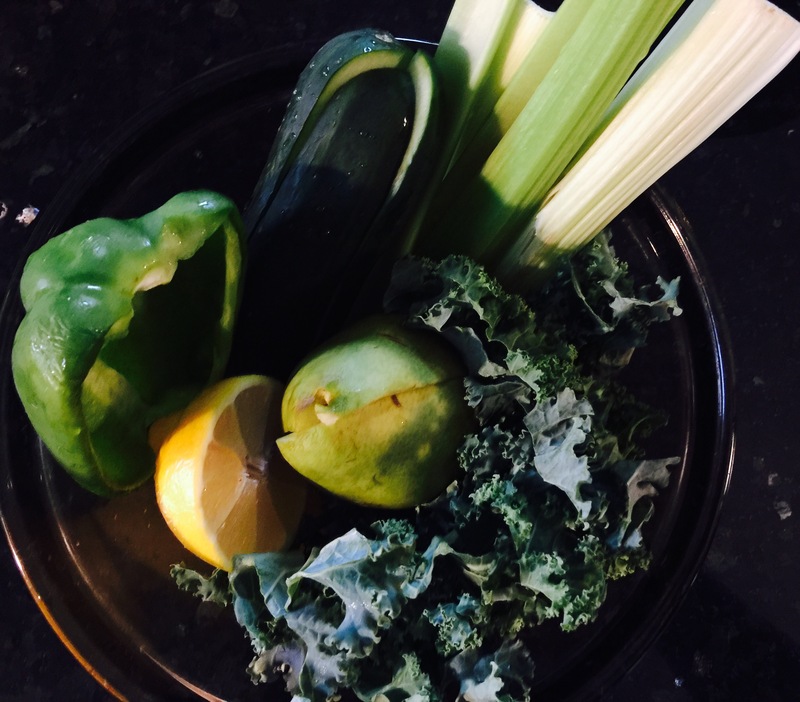 It was fun to combine the goodness of celery, cucumber, green pepper and kale. I opted for a pear over an apple. And the lemon gave the juice a nice zing. My creation was very tasty and I feel encouraged to try more juice combos on my own. As much as I enjoyed my own juice blend, I’m still going to name the Sunshine Juice as the day’s favorite. Juice…it truly does do a body good. It is so much more beneficial than that other drink that uses the slogan I borrowed from. At least, I can verify that it is doing my body good!